To view the video, click on this image. This is the third year that we have done our local history unit in October. 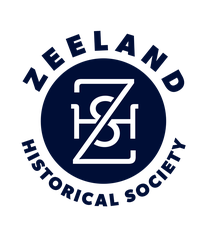 We start with a walking trip through downtown Zeeland, stopping at the first church, monument, and then finishing at the museum. 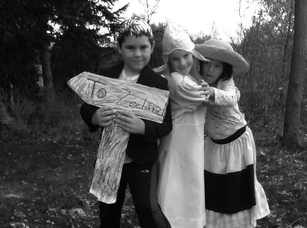 All Second Graders at Zeeland Christian are looking for a cool way to tell the story of how Zeeland started. This year, Mr. Meyer's Second Graders chose to make our reading loft into a boat. We then wrote scripts in groups of 2 or 3 and used actual ship logs to help us know the passengers. We then dressed up and took black and white photos to add to our digital book. We then recorded ourselves and presented our stories to parents and Mrs. Dorothy Voss.